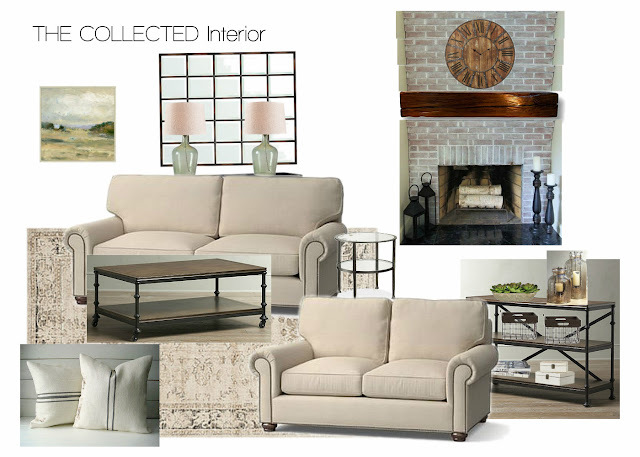 The Collected Interior: Friday Five! new sofa, client project, easy decorating tip & more! Friday Five! 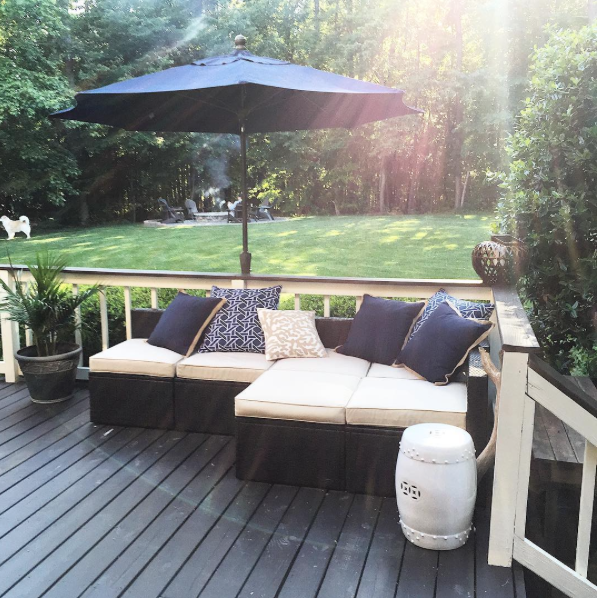 new sofa, client project, easy decorating tip & more! Our new sofa finally arrived and I am in LOVE! I chose the Performance Tweed fabric in Ecru, and am absolutely loving the lighter look in our home. And the fact that I can pull those slipcovers off to wash them is simply genius. From a functional standpoint, I am obsessed with slipcovers. In fact, I have exactly 11 slip covered chairs in our home, 10 dining chairs and now one sofa! I was shopping the other day at World Market and spotted this awesome industrial bookshelf! It's the Emerson Shelf and it has so much style, and it only cost $399. This perfectly balanced home office is from @blessedmammatobabygirls on Instagram, LOVE! 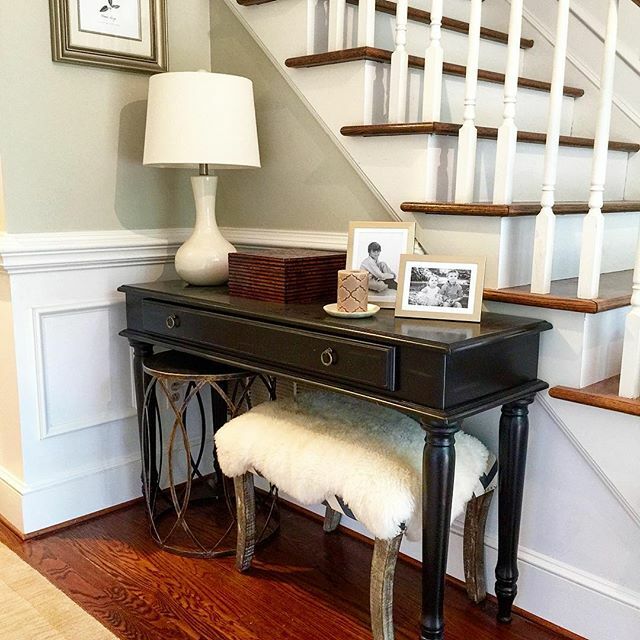 I shared our home's entryway table on Instagram the other day. You guys this table is literally about 14 years old. But with some fun accessories I was able to bring it back to life with pattern, texture and contrast. I like how the traditional lines of the table mix with the clean lines of the more modern accessories. On the work front, my latest Client Project is coming together nicely. We're doing a family room - Interior Room Design and the look is overall traditional with an industrial - farmhouse vibe that is so fun. Here's the Design Board above. 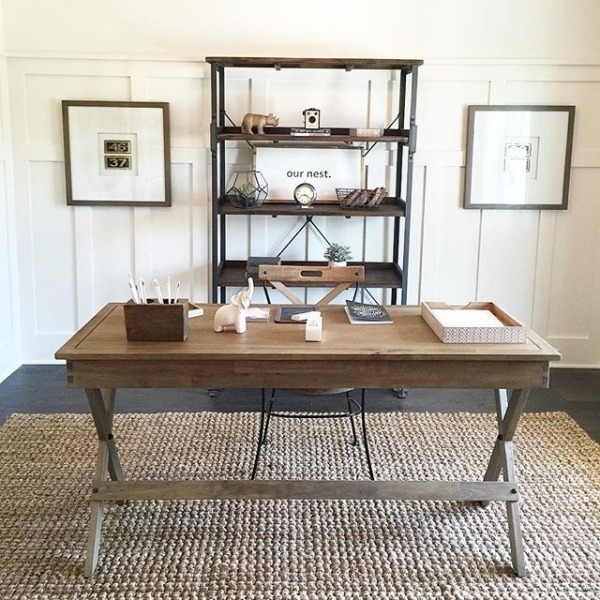 So far I am loving these industrial coffee and console tables sourced from Birch Lane! BL is one of my top sources for fabulous home accessories and furnishings. And guess what, those savings get passed onto my clients! And finally I have a decorating tip to offer today, and this picture above illustrates it well. When decorating any space indoor or outdoor, and after deciding on the main furniture pieces, attempt to incorporate color, pattern and texture. Here I've used navy blue as my color, the blue bamboo pillows offer my pattern, and texture is found in the coral pillow, the candle lantern, and even the wicker itself. So that's my tip...use color, pattern & texture - it's so easy! Doing this will add interest to your space, and keep your home's decor from falling flat. Okay guys that's my Friday Five, thanks for stopping by!